CALIBRATION OF MAGNETIC TWEEZERS - For laminar flows, a spherical bead, in response to an applied force F, will move with a velocity v = F/ 6πηr, where η is the dynamic fluid viscosity and r is the radius of the bead. Consequently, the force applied to a magnetic bead can be calculated by tracking the displacement of the bead over a period of time. Shown above: (top) the beads embedded in a media of known viscosity, (bottom left) the tracking of the position of the spherical magnetic bead, and (bottom right) the force calibration curves. The magnetic tweezers device built in our lab enables the manipulation of cells and molecules through the application of controlled mechanical forces (from a few pN to several nN) to micron-sized magnetic beads bound to the biological entity of interest. The working principle of this biophysical technique relies on the force generated by a simple electromagnet. An electrical current passing through a solenoid enclosing a ferromagnetic needle generates a magnetic field gradient that pulls magnetic beads towards the source of the field and to the tip of the electromagnetic core/needle. The current is controlled though a LabVIEW interface. The positioning of the tweezers is further controlled by a micromanipulator that allows translational movement across all three axes with nanometer precision. The force exerted on the cell-bound bead is critically dependent on the current and the distance between the tip of the needle and the bead. A particle-tracking algorithm is used for the calibration of the magnetic tweezer. The magnetic tweezers provide quantitative data on the local properties of living adherent cells (e.g. elasticity and viscosity). This data can be utilised to investigate a number of different aspects of cell biomechanics. This graphic shows this technique being used to investigate the microrheology of a cell. A single bead is tracked as a force pulse is applied to it; visco-elastic models can be fit to the resulting displacement of the bead and properties such as viscosity and elasticity can be obtained. Magnetic tweezers are used to apply localised tensional force on mechanosensitive cell adhesion receptors. The applied tension causes an adaptive remodelling of the cytoskeleton and strengthening of the adhesion complex as seen by the progressive reduction in the bead movement. Mechanotransduction (how cells translate mechanical cues to biochemical signals) may not be merely restricted to cell surface receptors and adhesions. 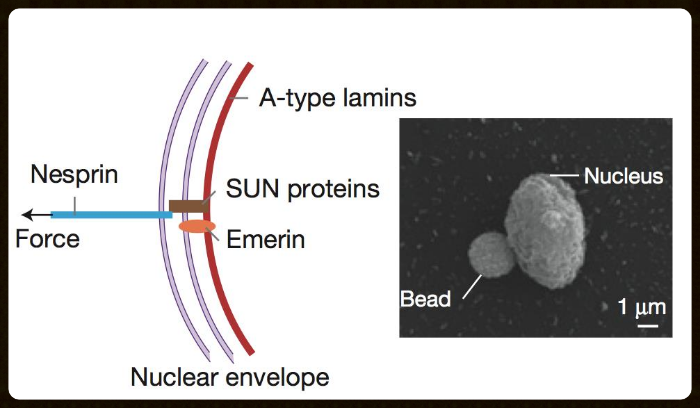 Recent studies have fuelled the speculation that the nucleus itself may also act as a cellular mechanosensor that can potentially directly modulate expression of mechanosensitive genes. With the magnetic tweezers we have the option of manipulating isolated nuclei from cells. This will pave the way for a better understanding of force transmission into the nucleus and the molecular mechanisms mediating nuclear mechanotransduction. Force application with the magnetic tweezers can also be combined with fluorescent microscopy and FRET (Forster Energy Resonance Transfer) to capture rapid mechanochemical signaling activities in living cells.